We’ve rounded up the tastiest allergy-friendly chocolates, candies and confections to ensure that you have your sweetest Valentine’s Day yet. Amanda’s Own has plenty of Top-8 free treats for the kids: chocolate conversation hearts and lollipops, double chocolate cookie dough and more! 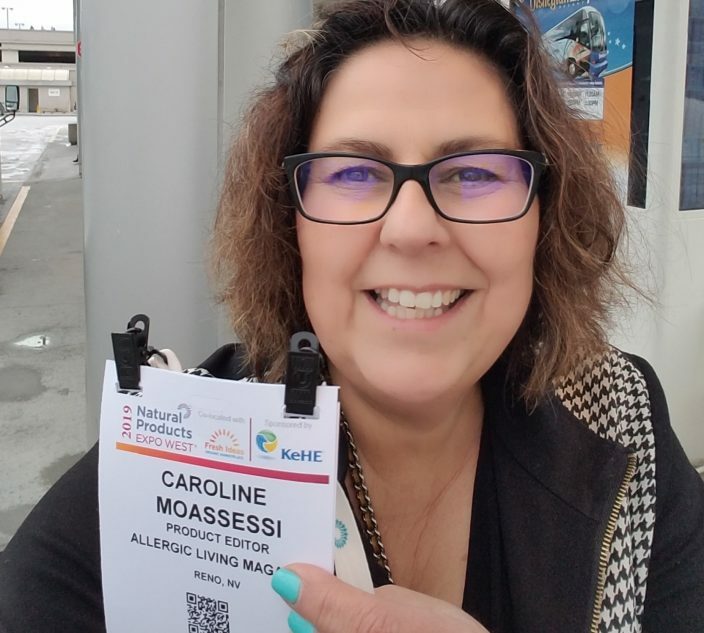 New this year, the company teamed up with Food Allergy Research & Education (FARE) and Food Allergy & Anaphylaxis Connection Team (FAACT) on two special products, with a portion of proceeds from the sale of each going directly to the organizations. Available via Amandasown.com (U.S. & Canada). When little hands are looking for treats, Enjoy Life Foods’ new Valentine’s Day Chocolate Minis are the perfect fit. 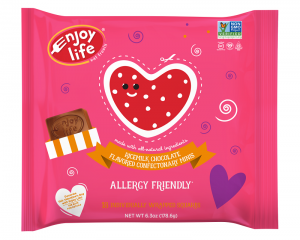 In rice milk, dark chocolate, rice milk crunch and variety packs, each bag of 18 individually wrapped squares provides enough allergy-friendly sweetness to ensure that little darlings feel showered with love. Available at major U.S. retailers such as CVS and Whole Foods. Also via Shop.enjoylifefoods.com (U.S. & Canada). For retail in Canada, find at Loblaws. Impress your sweetie with the incredible “Hugs and Kisses Tower of Gifts” from Vermont Nut Free Chocolates. 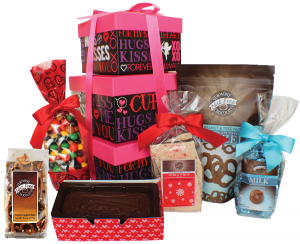 The delicious assortment includes Peppermint Crunch Bark, Chocolate Mini Twist Pretzels, Chocolate Fudge and much more! Available via Vermontnutfree.com (U.S. & Canada). For Valentine party handouts or post-dinner delights, these little, lightly sugared hearts can’t be beat. Soft, fruity and free of the top 8 allergens! 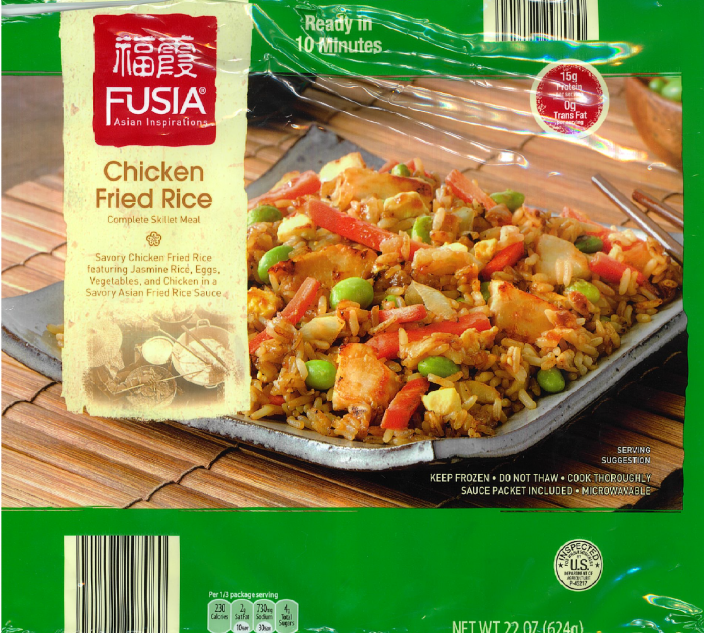 Available at major U.S. retailers such as National Grocers and Target. Also via Wholesomesweet.com (U.S. & Canada). In Canada, find at Loblaws and Bulk Barn. 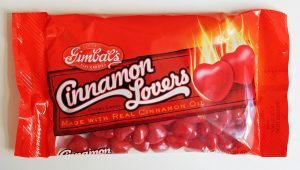 This Valentine’s Day, fire things up with a package of Gimbal’s Cinnamon Lovers chewy hearts — made with real cinnamon oil to keep things spicy! For milder celebrations, Cherry Lovers fruit chews will bring the sweet without the heat. Available via Gimbalscandy.com (U.S. only). 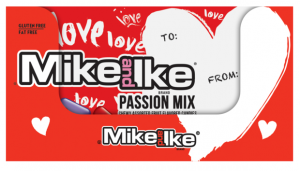 A favorite for allergy-friendly treats year-round, Mike and Ike gets into the heartfelt spirit with a Passion Mix brimming with assorted fruit flavors. These chewy little gems are a sugary fix that steers safely clear of the top 8 allergens. Available at major U.S. retailers such as Target and Walmart. Also via Peepsandcompany.com (U.S. only). With a variety of assorted chocolate boxes on offer, Amore Di Mona has allergy-friendly sweets for every Valentine. 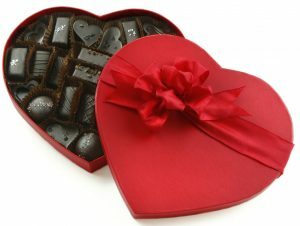 Still, there’s only one choice for your one true love; the 33-piece Amore assortment in a swoon-worthy, heart-shaped box. Available at major U.S. retailers such as Whole Foods and select Nordstrom eBar locations. Also via Amazon.com/amoredimona (U.S. & Canada). No Whey! 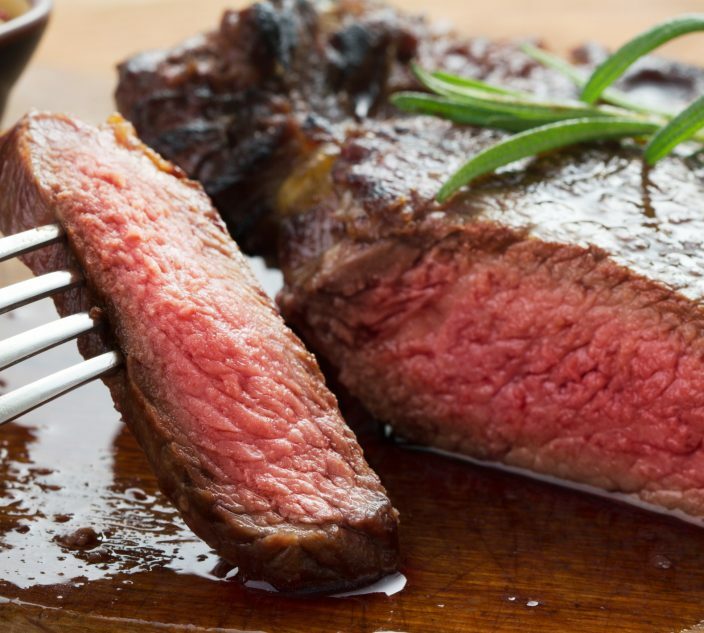 Foods have a variety of allergy-friendly delights. Chocolate lollipops make cute gifts for little ones. 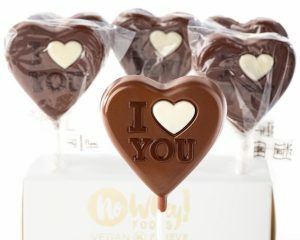 More serious declarations demand a Chocolate Love Box, with cookie-, brownie- and cake-stuffed treats, or a Heart Truffle Box, brimming with vegan chocolates in flavors like raspberry, salted caramel and coffee. Available via Nowheychocolate.com (U.S. & Canada). For a fresh take on chocolate fondue, surprise your sweetheart with organic Make Me Smile! 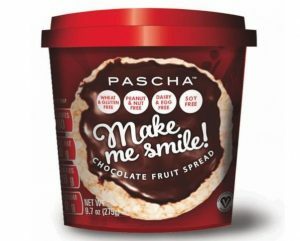 Chocolate Fruit Spread from Pascha. Made from fruit concentrates and cocoa, this rich spread can turn almost anything – from allergy-friendly cookies to fruit and baked goods – into a guilt-free indulgence. Available at major U.S. retailers such as Publix and Stop & Shop and select natural food stores. Also via Paschachocolate.com (U.S. only). In Canada, find at select Bulk Barn locations. Spread the love on Valentine’s Day with a sweet, safe lunchbox surprise. 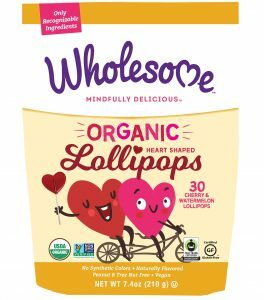 With a bag of Wholesome’s Organic Heart-Shaped Lollipops on hand, you’ll have 30 cherry- and watermelon-flavored ways to say, “I love you”. Available at major U.S. retailers such as Whole Foods and Target. Also via Well.ca and Wholesomesweet.com (U.S. & Canada). In Canada, find at Bulk Barn. 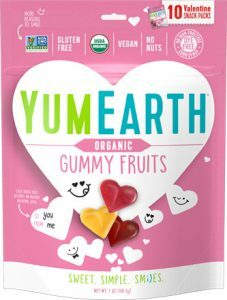 Opt for a valentine and candy in one neat package with YumEarth’s Organic Valentine’s Fruit Pops or Gummy Fruits. 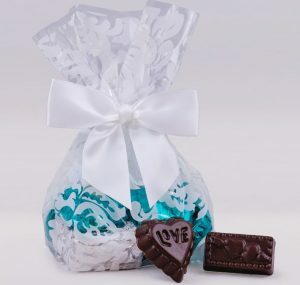 Made from all-natural ingredients, without dyes or high-fructose corn syrup, the most overly sweet thing about each mini-pack will be the love note written on its wrapper. Available at major U.S. retailers such as CVS and Target. Also via Shop.yumearth.com (U.S. & Canada). In Canada, find at Metro and Whole Foods. 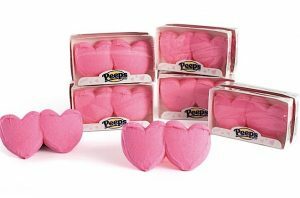 If two hearts are better than one, you’ll be on the right track gifting your sweetie holiday-ready, pink Peeps Marshmallow Hearts. For larger gatherings, Peeps Strawberry and Vanilla Crème flavored hearts come nine to a pack. Free of: Most top allergens and gluten. 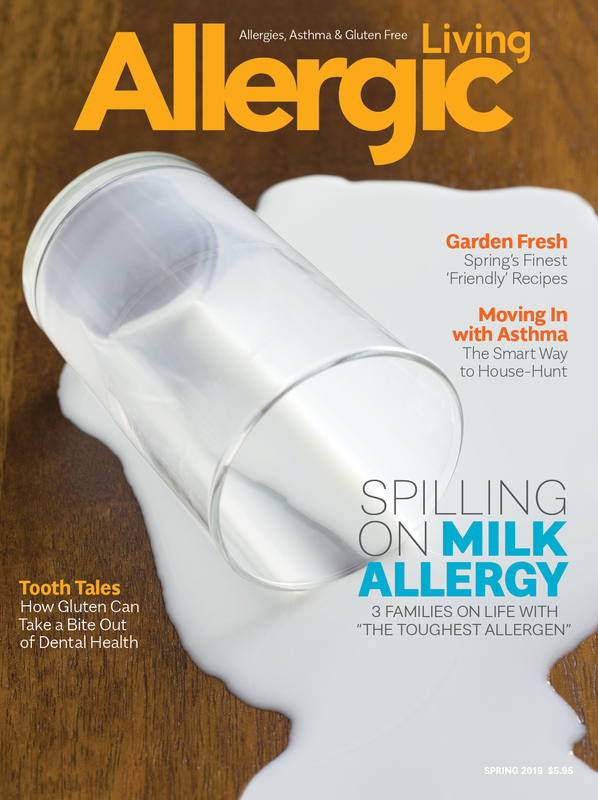 Dairy allergy exception: some varieties have a “may contain milk” label. Available at major U.S. retailers such as Target and Walmart. Also via Amazon.com and Peepsandcompany.com (U.S. & Canada). Most people agree that desserts should be packed with chocolate chunks and sprinkles, not legumes! Prepare to have it all, with Rule Breaker Snacks’ fudgy, decadent, protein-filled goodies. In flavors like P’Nutter Chocolate Chip Blondie and Deep Chocolate Brownie, these chickpea-based baked goods are sure to inspire a few lifetime loves. Available at major U.S. retailers such as Whole Foods and Kroger. 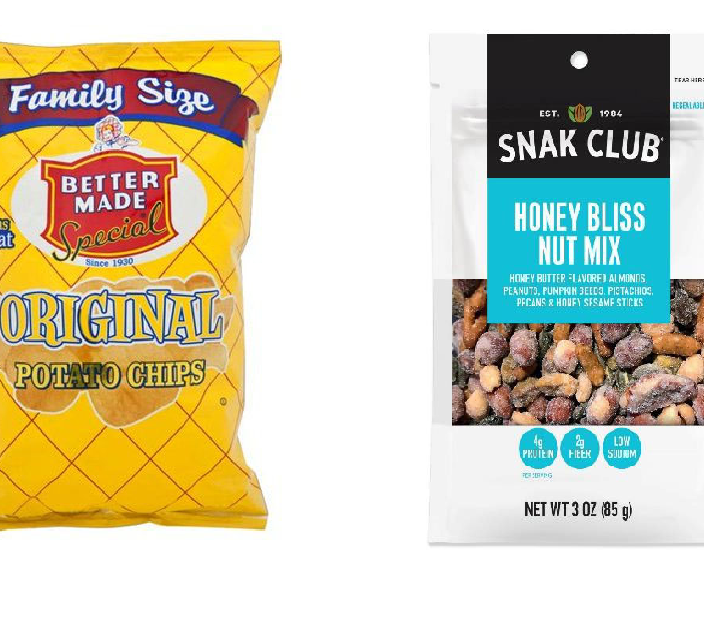 Also via Amazon.com and at Rulebreakersnacks.com (U.S. only). 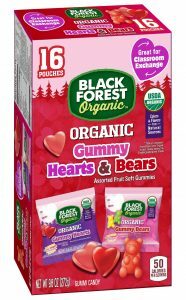 Help your kids step up their Valentine’s Day game with Black Forest Organic’s Gummy Hearts & Bears. 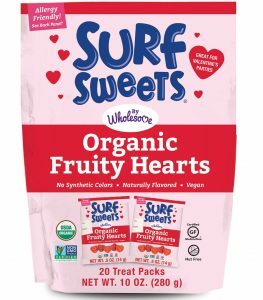 Each box has 16 pouches of assorted gummies, made with organic fruit juices for natural color and fresh, fruity flavor. Available at major U.S. retailers such as Target and Meijer. Also via Amazon.com and Candywarehouse.com (U.S. & Canada). Raymond Geddes is a go-to for novelty pens, erasers and other school supplies. 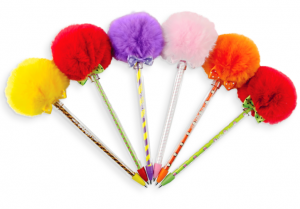 For Valentine’s Day, opt for the Love Pencils with Giant Erasers or Puffy Velvet Heart Pens. Either one is perfect for the occasion and sure to delight the little ones. Available via Raymondgeddes.com (U.S. & Canada). Worried that you’ll be tongue-tied on the big day? 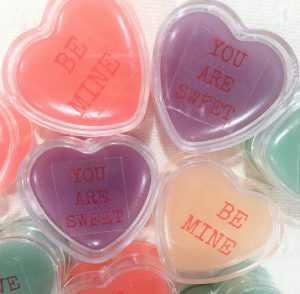 Stock up on Kiss Freely’s adorable heart-shaped lip glosses, sporting messages like “Be Mine,” and let them do the talking for you. With three shiny, soothing, allergy-friendly glosses per bag, your sweetheart will feel and look great, inside and out. Free of: Top 8 allergens, gluten, sesame, corn, sunflower seeds, beeswax, coconut, shea butter, parabens, petroleum and phthalates. Available via Kissfreely.com and Nonutsaboutus.ca (U.S. & Canada). For school handouts, swap regular paper for Mello Smello’s Etch Art Valentines. 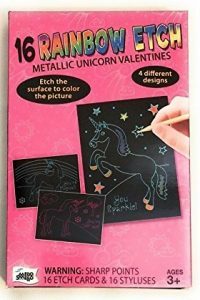 With 16 etch cards and styluses per box, in designs like Mermaids and Rainbow Metallic Unicorns, prepare to be branded coolest parent on the block! Available at major U.S. retailers such as CVS, Target and Party City. Also via Amazon.com (U.S. & Canada). In Canada, find at Shoppers Drug Mart. If a full house means you expect more ruckus than romance this Valentine’s Day, then the Hello Love Super Sticker Pack might be the most precious gift you can buy. 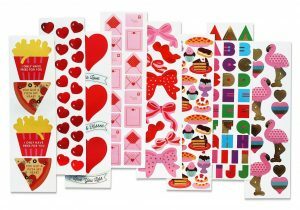 With more than 400 stickers, in assorted designs including hearts, flamingos, desserts and more, you’ll enjoy a few moments of peace while the kids happily create their most beautiful valentines yet. Available via MrsGrossman.com (U.S. & Canada). In bright, exciting colors, and some of the cutest designs we’ve seen, OOLY’s school and office supplies keep creativity flowing! Surprise kids with Heart to Heart Stacking Crayons or Sakox Lollypop Scented Pens and you’re a shoo-in for Valentine’s Day champ. Available via Ooly.com and Amazon.com (U.S. & Canada).